The Festival Committee is absolutely thrilled to announce Aldrine Guerrero and Aaron Nakamura will headline SPRUKE 2015. 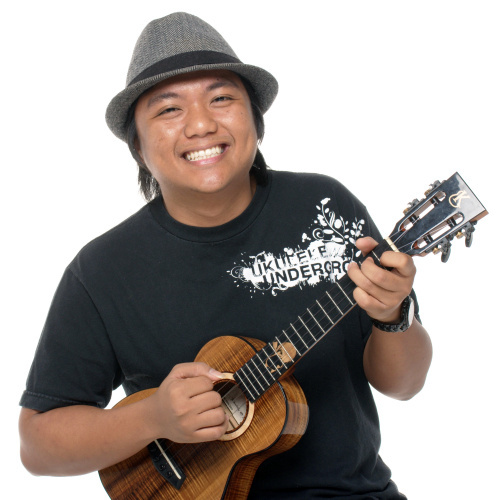 Guerrero has travelled the world teaching, playing and performing with his ukulele. However this is his first time in Australia. Joining Guerrero for Brisbane City Sounds performances and a series of festival workshops and concert performances will be his Ukulele Underground partner, Aaron Nakamura. 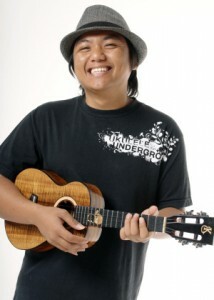 Aldrine is the head instructor at Ukulele Underground. With over a million hits each month, Ukulele Underground has a massive library of ukulele tutorials and the largest online ukulele forum. Aldrine keeps a steady social network on Twitter and Facebook, and his YouTube channel has piled up over 10 million views. Festival director, David Hethorn, anticipates many younger and media savvy ukulele players to be keen to get face-time with this talented musician. “This year the festival theme is Uke ‘n Make Music. The focus will be on learning to play the ukulele,” David said. “Even if you buy your first uke at the festival, you can learn to play and be making music by the time you go home. Our long-time members and more advanced players are looking for technique and performance inspiration from a world class act. Aldrine and Aaron will headline a diverse program of concerts, and an extensive range of workshops catering for beginners to master class. Aldrine takes styles of old and new, and mixes in his own formula of playful but yet mature sounds. Guerreros’ play style of ukulele, is described as a mixture of Hawaiian, classical, flamenco, pop, and 8-bit with unique vocals….. and he composes original ukulele music. Aldrine is also a multi instrumentalist that range from clarinets and saxophones to guitar and bass. Aldrine has released three full-length albums (‘Suite 409’, ‘I’m a Dreamer’ and ‘Bandito Tyler’) and two EP’s (‘Space suits’ and ‘The Four Strings of Christmas’). His ukulele work features in radio (NPR), television (MTV), independent films (A short history of decay), and a major animated film (Hotel Transylvania). Guerrero has played for national and international audiences in US, Europe, Canada, Thailand, Japan, Taiwan, Philippines, China, and Korea. More SPRUKE Festival program announcements to come very soon!